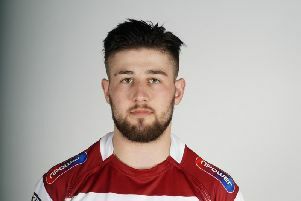 In a season which has already had plenty of off-field dramas, Wigan needed Gabe Hamlin’s suspension for a doping violation like a bloody nose. And plenty of people have been quick to give their views on Hamlin, on doping, on the punishments. On TV, on podcasts, on social media. I’ve not been one of them yet. And let me explain why. Over the years I reported on Gareth Hock’s ban and return, I ghost-wrote Terry Newton’s autobiography, I sat down and interviewed Zak Hardaker while he was suspended. Spoken to professors, campaigners and coaches, too. Poured through hearings and summaries and cases and appeals. I’ve read and written countless articles about doping. Grown tired of hearing mis-informed people say cocaine is banned because it’s illegal and because players are role models, when neither are true (for most of the year, it isn’t banned at all). This week, I’ve spoken to officials at UKAD and the RFL and Wigan. I’ve written stories which I hope explain why this Hamlin case may – like others – drag on for a while without a running commentary. But I’ve not yet given my opinion on what he has done. Why? Because – very simply – we don’t yet know what he has been accused of doing. And if that sounds like a cop-out, it isn’t. I have strong views about doping in sport. But my opinion about an athlete who has taken performance enhancing drugs such as steroids is very different to my opinion about one who has smoked a joint. My opinion on an athlete who has skipped a doping test is very different to my opinion about one who has carelessly taken a medicine with a prohibited substance in it. Of course I've heard rumours. But I heard recent rumours about another player which proved unfounded, I heard rumours about a recent rugby league player dealt with by UKAD which proved way off target, so I'm going to wait. Details of Hamlin’s case will be confirmed. It may not be soon, but when it is concluded the whole hearing will be laid bare. So I’m happy to comment about the negativity of the story, the loss to the team. And if you want my thoughts or a discussion about broader issues, such as the major problem of drugs in society, give me a call or email or tweet - I'm happy to get involved. But on Hamlin, I’m waiting until I know the facts before commenting specifically about his case. Feel free to accuse me of being boring. I’ll happily plead guilty. Dom Manfredi has suffered another serious knee injury. ‘Cruel’ doesn’t cover it. The winger has played just 10 games since returning from a two year lay-off with the same problem on the other knee. Two years, in which he went through what he described as a “nightmare” and was on the brink of quitting the sport to train to become a HGV driver. But his form at the back end of last year, and this season, has hopefully given him the self-confidence he can get over this – and get back to his best. In the meantime, I hope he gets all the support he needs. Wigan are certainly doing it tough right now with injuries, particularly in the engine room. Their international-class backrow of Greenwood, Farrell and O’Loughlin are all missing and their two veteran props, Flower and Clubb, are absent. In addition, Hamlin is absent and Joe Bullock – ear-marked for short spells until this point – has been thrust into the role of No.1 prop, much quicker than anyone anticipated. But we can moan about the Warriors’ luck or we can look at it as a great opportunity to give some young forwards vital experience. In an ideal world, these players would be drip-fed into the side; in the real-world, it has meant the the likes of Liam Byrne, Morgan Smithies, Ollie Partington and Liam Paisley will get chances they probably didn’t expect. And I’m excited by it. It will serve them well, and longer-term, it will serve Wigan well. When Super League peeled away from the RFL control, the popular line was it would allow everyone involved in the competition to put their focus into promoting it. “The RFL are trying to do everything, and that dilution means nothing succeeds,” said Wigan chairman Ian Lenagan last year. And I nodded along in agreement. But flip that on its head, and by removing Super League from the governing body's umbrella, it has also allowed the RFL to focus on the areas of the game it is responsible for – the academy, the women’s game, the Challenge Cup, the internationals, the Championship and League One. And I’ve got to say, they’ve done a pretty good job of promoting many of those areas. The women’s competition had a good launch. We’ve had press releases about the Cup, the internationals, the academy, and a media briefing today. Super League, meanwhile, seems to have gone a little silent since its spectacular launch. Its website is showing the type of content it's long had – mainly, a news feed from the PA wires – and the Magic Weekend promo video was less than inspiring.